SAN JOSE, Calif. August 7, 2018 -- PLDA, the industry leader in PCI Express® IP solutions and Kazan Networks, a leader in advanced storage technology based on the NVMe over Fabric (NVMe-oF™) standard, today announced the integration of PLDA’s XpressRICH3™ PCI Express Controller IP into Kazan’s Fuji NVMe-oF Bridge ASIC. 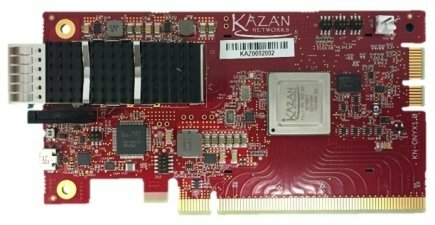 Ensuring low latency and high throughput over the PCI Express interface is a major requirement for NVMe-oF designs and Kazan has selected PLDA's XpressRICH3 PCIe Controller IP for their network storage device because of PLDA’s extensive track record in developing and licensing high performance customizable PCIe Controller IP. Both companies will highlight their product lines at the upcoming FMS show. NVM Express™, or NVMe, is the interface of choice for high-performance solid-state storage devices and its physical connection is based on the PCI Express protocol. The PCIe interface provides a direct connection between a server’s microprocessors and NVMe devices attached directly to the server. While this type of configuration is ideal when populating a server with a few SSDs, it rapidly reaches limitations in more extensive configurations. NVMe over Fabric, commonly referred to as NVMe-oF was developed to solve these challenges. By mapping the NVMe command set onto an existing fabric, the number of devices capable of being attached to a system increases from a handful to several thousand. Furthermore, pooling flash capacity immediately becomes a practical application, allowing a more efficient design for datacenters and enabling composable infrastructures. “PLDA is thrilled to contribute our best-in-class XpressRICH3 IP to Kazan Networks’ innovative NVMe-oF ASIC, and enable the industry’s best discrete bridge solution for storage applications,” said Stephane Hauradou, CTO of PLDA. PLDA’s XpressRICH3 IP is a highly configurable PCIe 3.0 interface Soft IP designed for ASIC and FPGA implementations supporting endpoint, root port, switch port, bridge and advanced features such as SR-IOV, multi-function, data protection (ECC, ECRC), ATS, TPH, Advanced Error Reporting (AER) and more. XpressRICH3 is the industry’s PCIe IP of choice for enterprise-class applications requiring the highest performance, reliability, and flexibility. Kazan Networks has developed the world's lowest power and fasted NVMe-oF bridge solution, designed specifically to enable NVMe JBOFs to connect directly to an NVMe-oF network. Plugging into a standard x16 PCIe slot in a JBOF, a single Fuji adapter board is capable of delivering 2.8M IOPS (4kB) and over 11GB/s. Add up to 6 adapters to a 2U/24SSD JBOF and you will see performance topping 17M IOPS / 65GB/s! And there's no set of high-powered embedded processor required like other, RNIC-based "solutions." Visit Kazan Networks at Flash Memory Summit 2018 in Santa Clara, CA in booth 700. Kazan Networks is a privately held startup founded in Dec 2014 by storage networking veterans. The company is located in Roseville, CA, and is currently shipping products to select customers and partners. Find out more about Kazan Networks at www.kazan-networks.com .